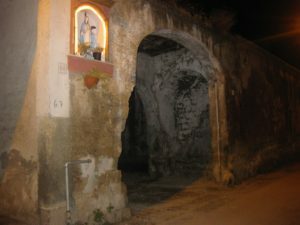 An altar with the Madonna set into the wall, situated on a tiny street directly across from my father’s childhood home. One night, when I was a little girl, I walked into my mother’s room as she lay in bed watching television, the blue-red light of the screen shafting over her sleepy face, and I don’t recall how, or why, but the matter of Jesus came up. My best guess is I had recently started CCD (Confraternity of Christian Doctrine) to begin learning about Catholicism and preparing for my first communion, and the whole subject had peaked my curiosity, as most things did, both then and now. My poor mother – uneducated, unschooled beyond the elementary ideas she had learned rote as a child, and tired after working the line in the kitchen at the local hospital, after cooking for my father, three siblings and me, and cleaning up after us, too – had to deal with her capricious, inquisitive American young daughter, asking her questions about the Holy Trinity. “You never stopped with the questions,” my sister, who is nine years older than me, often reminds me of my childhood self. Things mattered to me, I took them seriously, and I guess in many ways, still do. Whatever our exchange that night in my parents’ bedroom, I recollect it ended with my mother telling me that Jesus would forgive my sins, no matter what I did. He would erase them. I had only to ask. I found this overwhelmingly dazzling. I may have begun to float instead of walk away. For some reason I’m not quite sure of, this notion that I would be absolved and loved no matter what erroneous choices I made filled me with joy. I walked out of that room ecstatic. The Good News shot right to my soul. I’m not going to pretend that in the years that followed I was a straight-and-narrow, devout Catholic. I certainly wasn’t. Even still, I joke I’ll never be the Pope’s favorite. I sometimes miss Mass on Sundays, but try not to. I ignore, as many young folks these days do, certain dictates by my lifestyle choices, but try to adhere to others. For all the times I fail to go to confession, I make it to church on All Soul’s Day and light the red votives and pray for the dead, and I am sure to make it to Mass on Ash Wednesday, to be reminded that from dust I came and to dust I shall return. With all my shortcomings, I adhere to the faith of my ancestors even still because it gives me a line that tracks back through my ancestors, connecting me to my Southern-Italian roots. In addition to being a foundation that saves me, time and again, from myself and from the valleys we fall into throughout our lives, the Catholic faith links me to those who came before and makes me part of something larger. And as something I was born into, it is my inheritance. When I light a votive, hold the rosary, or kneel at Mass, I know I am doing something my ancestors did. I am doing something they would understand. If they could see me now, they would recognize and understand little else about me – not the tattoos I have, not the nice clothes I wear, not the low-carb, health-conscious diet I eat, not the weights I lift in the gym, or the three miles a day I run, not even the country I live in – but this aspect of my life, they would recognize. Through the decades and generations, through death and life, the tradition of Catholicism clutches us to one another. It is a deep, mystical tie that binds me to them, and them to me. This is why when I hear young parents today say things like, “We’re not raising her with any religion. We want her to choose for herself,” I cringe a little. The Southern-Italian, Roman-Catholic heritage my parents raised me with is as much a part of who I am as being Italian is; I can’t imagine my parents not giving it to me, and then letting me decide if it is something I want to keep. To sever the tie before your child has even had a chance to hold it seems to me a shame. I understand there are Jewish Italians, and Jehovah’s Witness Italians, but there is no denying that Italy is a Catholic nation, the tendrils of the faith weaving through its culture and history. Walking through the streets of Napoli with one of my cousins several years back, visiting the churches, the myriad of small and large chapels, their walls plastered with ex-votos and the gratitude of thousands who were healed, the relics displayed in glass cases, the stained glass, the gold, the marble – all the accouterment that marks Southern-Italian Catholicism, I felt – home. Crucifixes, rosary beads, images of saints and Madonnas have always made sense to me and brought me comfort. Like a piece of the puzzle of myself, Catholic imagery easily clicked into place. 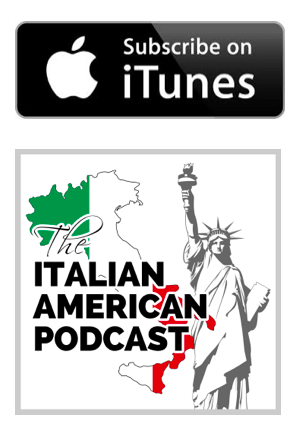 As we discuss with filmmaker John Maggio in Episode 24 of The Italian American Podcast, there is a certain style to the Catholicism of our immigrant ancestors. When Southern Italians arrived in America, the Irish Catholic priests who dominated the Church were aghast at our garish worship: The idols, the statues with dollar bills taped to their porcelain robes, suffering saints framed and hung in bedrooms and kitchens alike, all of it, was uncouth to the Irish. Our worship was not intellectual, but physical; not of the book, but of the heart; not silent, but audible. 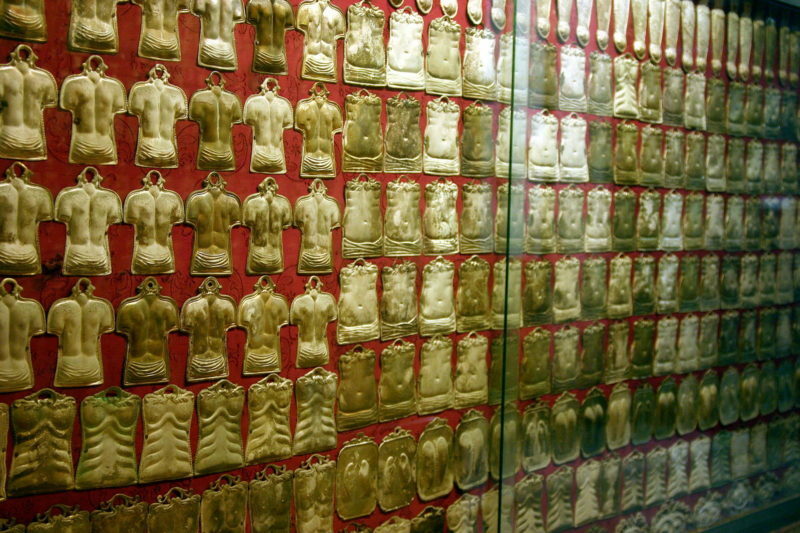 Because of this, the Irish priests made Southern Italians worship in the basement of their churches. Which eventually drove Southern Italians to hoist those statues and march through the streets in procession, a hallmark of the many feast days Italian Americans continue to host and attend to this day. The failures and sins of the Church are many. I understand why so many young people – my childhood friends who sat next to me in the pews during CCD among them – have turned away from it. They have opted for a disjointed nothing or a New Age spirituality, devoid of religious adherence. I have a love/wary relationship with the New Age spirituality of our day. While I enjoy yoga and appreciate its benefits, while I meditate and appreciate its benefits as well, while I read many books written by New Age leaders, there is always a point at which I start to squirm some, because it does not feel like it belongs to me. I can’t call God “Goddess,” or the Holy Spirit “Universe”; to quote Buddha or the Dali Lama, hip in so many circles today, makes me feel awkward; about as uncomfortable as it makes many of my peers feel to talk about Jesus. It feels like putting on someone else’s clothes. But at Mass, or while praying the rosary, or asking the Holy Spirit to help me be more loving to others and myself, I feel like I’m wearing the right outfit, a suit tailored to my type. Now that Italian Americans have assimilated and become so very “civilized” (check out our talk with author Tom Santopietro in Episode 10 of The Italian American Podcast for a great conversation on this), many of my piers are discomfited by, or “beyond,” this type of worship. It’s embarrassing to them, the way the wailing of our Italian grandmothers at funerals is now embarrassing and undignified; the way plastic on a living room sofa is now laughable and provincial; the way we want our sons to be professionals and not plumbers; the way we choose career advancement over the cloistered safety of the neighborhood. I am as assimilated as any of us, but I also keep an altar in my room, much like the one my mother and myriad aunts have in theirs, with photos of the dead, prayer cards, candles, and crosses made out of palms; I hang the rosary near my bed, with statues of the Madonna beside a photo of my godchildren. And by doing so I take claim to my heritage. This is mine. I adore it as much as I adore the Neapolitan song tradition and the ritual of jarring tomatoes. To me, it’s another aspect of being Italian American. Catholicism is a gift, another blessing I thank my heritage for giving me. In American society, we’ve been taught that religion is a straight jacket, something to break free from; as much as I was reared in the tradition, just months in an American university began to shake it out of me. Spirituality, not religion, is fashionable these days, and if it’s between spirituality and nothing, I’ll take spirituality, because we need some compass, some order, some foundation to stand on. But for me, I take it as an embarrassment of riches that this foundation comes to me through my Italian heritage. Because of this I am bolder, stronger, anchored, more dignified and whole. I know it’s not for everyone these days, but I do hope that some of you, and some of your children, might consider returning to Catholicism if, for no other reason, that it connects you to your ancestors and ancestral home. That it can also embolden and empower you is just a beautiful side effect. Amen, miei cari amici, to that.